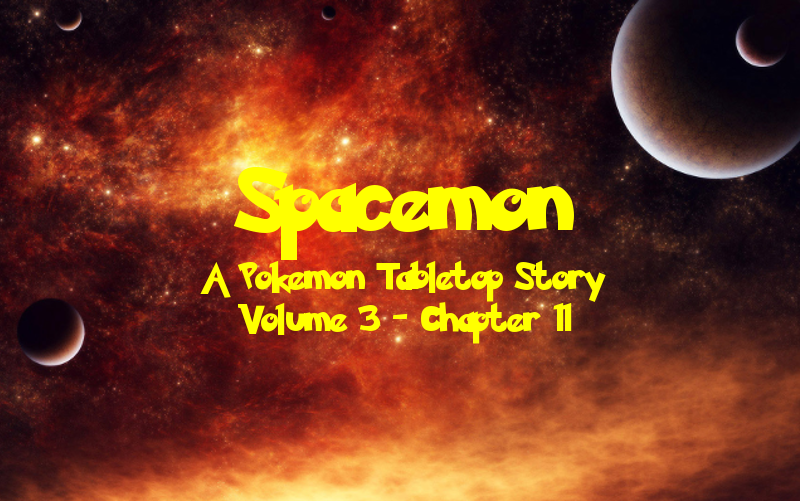 Welcome to another tragic installment of Spacemon, the tale of a Pokemon TRPG campaign! It is a sci-fi space epic played using the Pokemon Tabletop United (PTU) system and GMed by fellow TAY author DragonStorm247. You can get caught up on our previous adventures here! The crew of the UAS Helix traveled to the coordinates that I provided to H and Meta and located his base. Upon boarding the station, they discovered that I was conducting research on powerful ancient Pokemon such as Giratina and Darkrai and the forces of Space, Time, and Entropy. After a fierce battle with I, the crew was once again unable to prevent the cyborg from escaping, but not before he revealed that he was holding Alex’s father, Dr. Robert Hawthorne, on the station, studying him to better understand Darkrai. Deep within the wing of the station dedicated to the study of Entropy, Alex finally found her long lost father… but it was not a happy reunion. Dmitri used his influence over Darkrai’s aura to lift the effects it had placed upon Hawthorne, but Alex soon discovered that her father’s greatest fear was her. After Alex pleaded with him to come with her, Hawthorne ultimately killed himself with his daughter’s own plasma knife right in front of her. Alex’s scream of pain as she watches her father’s body slump to the ground pierces the eardrums of her crewmates. The girl runs to his side, but she doesn’t know what to do. She pulls the blade out, and blood begins to squirt from the wound. “No no no. Why? Please.” She begs and pleads to no avail. There has to be something she can do. Anything. Hawthorne tries to speak, but only the sound of air escapes through the hole in his throat as he chokes on his own blood. Shane rips Alex away as Morgan runs over to try to save her father. “No! No! No!” Alex screams as she struggles against Shane. Morgan tries to stop the bleeding, but, at this point, she can’t save him. “I’m sorry, Alex. There’s nothing I can do.” The room falls silent, save for the sound of Alex’s sobs. “Oh, would you shut up!” H finally shouts at the girl. Shane lets go of Alex, and she slumps against the wall, completely silent; she has no tears left to cry. Shane walks over to H and punches him in the face. “If you only answer with force, you have no answer at all,” H tells him. “You’re only proving my point. Her father was worthless and him dying is just going to cause more problems unless she just ignores it and-” Before he can finish his sentence, Morgan walks up to the cyborg and slaps him across the face. “H, imagine if it was Armstrong who died,” Shane tries to reason with him. “Then I would do what I could to get over it and move forward,” H replies. “Then help Alex do that instead of just yelling at her,” Shane tells him. Alex remains silent and unresponsive. While H picks up Hawthorne’s body, Morgan walks over to the girl and grabs her arm. She pulls Alex up, onto her feet without any resistance. Morgan then turns to the door and leads Alex by the hand after the others. Returning once more to the central control room, the crew notices several flashing lights displayed on one of the holoscreens. “Those are new,” Shane observes. He walks up to the screen for a closer look. “What does it mean?” Dmitri asks, walking up behind Shane. “Whatever it is, it it can’t be good,” Shane tells him. He starts pressing buttons, and video feeds of various labs appear on the screen, labs designed to produce more Mewtwos. As the lights go green, the Mewtwos begin to awaken, breaking out of their stasis pods, tearing through the walls of the stations that hold them. The crew makes their way through more winding corridors, and they eventually wind up in the Time wing. Moving through the first chamber, they see walls lined with various pieces of machinery and equipment and another door on the far side. They quickly move through the room and into the next, much larger chamber. A giant sphere of rock, metal, and crystal floats in the center, filling most of the space. The crew gazes in awe upon the sphere and feel themselves losing track of time. Alex stares at it as images of her dead father continue to flash through her mind. She is painfully aware of its exact dimensions; its diameter varies due to its rough, uneven surface, but it is approximately thirty meters. Shane walks up to the sphere and touches it with his unmarked hand. Almost immediately, he feels the other one burning. It reminds him of the feeling he experienced when the Helix approached Darkrai. He quickly moves his hand back as he winces in pain. Morgan let’s go of Alex and runs over to Shane. “What happened?” she asks. Morgan turns her attention to the sphere and reaches out for it. As she runs her hand along to bottom, she feels her perception of time going wonky. She gets the sense that it’s reacting to her touch. She places her other hand on the sphere and she sees all of Time stretching out before her. Focusing her thoughts on I, Morgan’s view of Time narrows to a single point. She sees a Mewtwo augmented with metal plating, glowing with electrical energy, but she is unsure where or when. Slowly, other Mewtwos appear behind it as it flies forward. The others follow as it moves toward Giratina, Darkrai, and another entity, which Morgan does not recognize. As the Mewtwo reaches out for them, Morgan begins to lose focus, and her view shifts once more. She sees the Eye being moved, transported to this station from a different location on a large ship. She tries to stay focused on this vision, hoping for some insight as to how she and her crewmates might move the sphere off the station, but it slips away, and she finds herself sucked into the Bunnelby hole of galactic history. Morgan sees the cycles of the Galaxy play out before her. Human and Pokemon life is seeded throughout the Galaxy, Human civilization develops, then the Mewtwos come and begin the harvest. Humanity fights against the Mewtwos, but inevitably loses. Over and over the cycle repeats. Forcing the images away, her vision settles on a single point in space. She doesn’t know why, but she knows the coordinates are in Genevan space, although she is unsure if Geneva even exists at the time the Eye shows her. Morgan’s vision zooms in on a single planet, covered with snow and ice. She can see a man encased in the ice, sealed away in a cryotube on this icy world. Then, she sees him standing in the snow, unfrozen. He pensively gazes up at the stars and falling snow. From what Morgan can tell, this man doesn’t appear to be of a race currently populating the Galaxy. Soon, Morgan finds herself pulled back once more into the void of Time. As she falls deeper within, she feels another presence briefly touch her mind. Morgan realizes that the Eye contains an entity similar to Giratina, and now it is aware of her. Slowly, she can feel understanding filling her. Time, she realizes, is a stable force; the past and present are set, but the future is not, even though it remains stable. Certain events are set to happen, but their contexts and outcomes are undetermined. These events can put pressure on Time, and manifest themselves as visions. Morgan take solace in fact that nothing is predetermined. Even if certain events are bound to happen, there are things that she and her crewmates can do to ensure better outcomes. This knowledge fills her with hope. As she lets go of the Eye and steps back, Morgan has one final vision. She sees the station, the Eye floating in its chamber. A Mewtwo slowly floats up to the sphere and touches it. Then, the vision fades, and she finds herself standing before the Eye once more. “-not normal,” she can hear Shane’s voice fade in. “Uh, your eye,” he replies. “When we get back to the Helix, look in a mirror.” Morgan’s non-cybernetic eye now glows a bright silver. “Enough standing around!” H suddenly shouts. He releases his Rhydon as he runs up to the sphere. “Let’s move this thing, #1!” As he makes contact with the object, H sees other humans using it to transmute materials and wonders if he could combine it with a particle collider to do the same. “But this thing is too important to leave here,” He counters. “All the more reason for us to take it!” H argues. “But, if we bring it with us, the Mewtwo will probably just follow us,” Dmitri warns. “We could just come back for it later,” Shane suggests. “It might not be here later,” H points out. “I only saw it touch the Eye though,” Morgan tells him. While the others debate what to do, Alex slowly walks up to the sphere. The scene of her father’s suicide continues to replay through her mind over and over. It’s all my fault, she thinks. There must be a way this thing can fix this. Alex brushes her fingers across the object, and feels herself swallowed by Time. She sees her life unfold before her eyes: all the memories of her father, every moment of him avoiding her, every hard time, every attempt she made to end her own life. The last thing she sees is herself lying in a pool of her own blood, just before Morgan pulls her away. “Alex, what did you see?” Morgan asks her. Alex just silently stares back into her eyes. “C’mon, we’re leaving.” Morgan grabs the girl’s arm and pulls her along after the others who had already begun to leave. The crew makes their way to the nearest hangar, then contact Minerva. The pilot brings the ship in a short while later and picks them up. Back on the ship, everyone scatters. Morgan brings Hawthorne’s body to the medbay for preservation, while H, Shane, and Dmitri go off to their respective labs. Alex wanders around the ship’s corridors in a daze, eventually winding up at her room. Eventually, she stands up and clenches her fists. She knows what she needs to do. Alex pulls out her plasma knife and looks at it for a moment. She can see her father jabbing it into his throat. Now it’s my turn, she thinks. She activates the blade, then holds it up to her own neck. “Let go of me!” Alex shouts back at her. “I have to do this!” She struggles to pull her arm free, but Naomi’s grasp remains firm. A rush of emotion flows through Alex as she hears the words. In seventeen years of life, not once had anyone told her that they loved her. She never really had anyone to love her. In this moment, Alex realizes that she can’t do to Naomi what her father did to her. I will not be like him. The plasma knife falls from Alex’s hand and clatters loudly against the floor. She hugs Naomi as she breaks down into sobs. Naomi leads Alex over to the bed and sits her down. She sits beside her and holds her tightly against herself. Shane sits in his lab, staring into the Warp, trying to learn from it. Suddenly, it occurs to him that he should probably check on Alex. He heads up to the upper deck and pokes his head into her room. He sees Naomi is already there, comforting Alex as best she can, and decides to leave them be. “Alright, they have a moment,” H replies. He stands there silently for a brief moment. “Alright, the moment’s over.” He moves to enter the room, but Shane grabs onto him and teleports both of them to the furthest part of the ship. “Just… go away,” Alex tells him, still very clearly distraught. However, that fact is lost on H.
“Hey, just leave her alone,” Naomi tells H, standing up in front of Alex. “Her father just died.” She moves to step forward, but Alex grabs her arm and pulls her back. “No… He’s right,” Alex tells her. She stands up and walks up to H. “Okay,” she says, new determination in her eyes. “Because I actually care about other people,” Alex tells him. “Would you go to any lengths to save them?” H asks. “I would do everything in my power to save them,” Alex replies. “Yes,” Alex responds decisively. She reaches out and shakes the cyborg’s hand. “Wonderful.” H turns to leave and walks right into the door. He quickly stands up, brushes himself off, unlocks the door, and leaves. Shane quickly pokes his head in and looks around. “Everything okay in here?” he asks. Shortly after the departure of the UAS Helix, several ships drop out of warp space around I’s base to reinforce the station, chasing away the attacking Genevan ships. They dock with the station, and armed men board and spread out across the various wings. Several hours pass as the guards disperse across the station, securing all the equipment and artifacts within. Suddenly, an alarm blares as a being drops out of warp space. It slowly approaches the station, and peels the wall of the Time wing away. Once inside, it seals the breech, and gently floats up to the guards surrounding the Eye of Aether. “Halt!” one of the guards shouts as they all raise their weapons. The being raises a hand, lifting the guards off their feet and pulling their weapons out of their hands. “Poor Humans,” it speaks in a soft, but equally terrifying voice as it floats ever nearer. “So full of suffering. Do not worry Humans, I will show you mercy.” It clenches its fist, and the guards’ necks all snap. The creature releases its grasp, and the lifeless bodies slump to the ground. The being floats up to the Eye and touches it with an outstretched hand. Interfacing with the sphere, the creature is slowly filled with the ancestral knowledge of the Mewtwos. Session Notes: After last chapter’s cliffhanger, at last we can see the results! It’s been a while since my last post, but I’ve been busy as hell. To start off, we have the last like ten or fifteen minutes of the previous session, which I made the creative decision to move to this chapter as the moment selected to end the last chapter was so perfect. We did a brief recap for the sake of Clarissa, who had to step out early for the previous session, so I ended up sort of blending those together with the transition to the next bit of the session. Once again it was a great opportunity to show the difference between H and everyone else. He was incredibly harsh on Alex, and got himself punched and slapped. Then it was on to the Eye of Aether! The artifact we all expected to have acquired quite a while before this but somehow didn’t! Here it just sort of gave Morgan some clues as to where to go next, as well as provide her with a brand similar to those of Shane and Dmitri. It really didn’t end up being as immediately useful as we would have hoped. We were really expecting a Deus Ex Machina, but it felt like just a thing. Ultimately we left it behind, because it seemed a Mewtwo was after it, and we couldn’t fit it on our ship. The following scene was actually something I wrote ahead of time. I had actually been fully prepared to RP that moment with Alex and Naomi for the previous session, but due to time and the way things played out it had to be pushed. So I just synthesized it into lines to read during the session. Special thanks to Clarissa Gavin for reading them with me! DragonStorm gave her some bonus EXP for volunteering. This is a moment I knew I wanted to be perfect, one to fully capture Alex’s character shift. Alex’s one goal in life has been torn away from her, the dream she’s been chasing has crumbled away. In her mind, she has no reason to live for herself anymore, but Naomi has shown her other reasons to live. Alex is no longer living for herself, but instead she is now living for others. Gone is the somewhat selfish child you’ve grown to know. In her place we have a different Alex whom I hope you will enjoy seeing grow and mature over the final few chapters of Spacemon. And then H came in and disrupted the moment! His player was actually ready to just interrupt the scene, but since it was an important moment for Alex’s character development, DragonStorm made him hold off until after we finished reading the lines. I was actually prepared for a similar moment for this session where Alex would go to H, understanding their need to work together if she wants to protect the people she cares about, but he ended up coming to her instead. It turned out nicely in the end. Finally, we have our little post-session scene. Morgan’s vision as she let go of the Eye has come to pass! Although DrgaonStorm had this scene happen at the end of the session, I felt it seemed more fitting to stick it here at the end of this chapter. Be sure to check out the seventh and final installment of Seeing Red, the miniseries starring my former character, Arlon Jett! Post-Chapter Challenge: And so, we have begun our final stretch! The campaign finished up this past weekend but, since I’ve been so busy, there are three sessions worth of chapters left to be posted. Given that we’re almost at the end, I want to make the comments on the last few chapters as engaging as possible! Today’s challenge is simply to leave a comment! If you’re a longtime commenter, do what you always do! But maybe you’re a longtime reader who has yet to comment! Don’t be shy! Come say hi and let us know what you think of the series so far! Or maybe you’re one of the players who hasn’t commented in a while, or ever. No matter who you are, discuss things and have fun! Theorize what you think will happen, share your opinions on the story so far, or just talk about what happened in this chapter! I look forward to responding to you!